What do math and music have in common? Numbers tell us a lot about music! Math explains why notes sound higher than others, why instruments look the way they are, and why some sounds are more pleasing to the ear than others. Math and music are universal languages and use patterns to convey meaning! On November 3rd, at this year’s Marion Cilker Conference at SJSU, RAFT’s Education Team’s Jeanne Lazzarini and Dianne Hurvitz co-presented “Harmonizing with STEAM Standards” on that very subject in front of enthusiastic SJSU students! 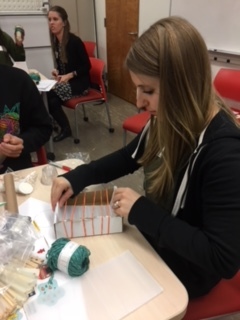 Participants tackled a Design Challenge creating music collaboratively out of recycled materials and making connections with mathematics! This challenge also introduced other opportunities for cross-disciplinary STEAM lessons in literature, technology, engineering, and science! Make a musical instrument out of recycled materials in a design challenge! Then play a song, explain the different pitches and notes, and the math involved! Compare different rhythms: The sound of waves crashing onto the shore; the sound of a heartbeat; the ticking of a clock; the blinking of a traffic light; the beat of a drum; and other examples of natural and manmade rhythms. Investigate and compare: The pitch of matching notes in stringed instruments to that of wind instruments. Notice the longer the string (longer the tube), the lower the tone. The participants teamed up to produce music on their instruments resulting in some remarkable harmonies with STEAM Standards! For more information on music and math connections, check out our RAFT tip sheet “Connecting Math and Music.” And check out this link for more about the 2017 Marion Cilker Conference!